In previous articles we examined how to begin a unit on ecosystems. Once you get started there is no better time to have your class begin making their own eco-columns. I learned of this model from a great hands-on unit offered by Carolina Biological, a company that provides science unit kits to elementary schools. So, from them to me to you. In the beginning of the year you’ll want to request donations of two liter soda bottles. You’ll need three for every pair of students. 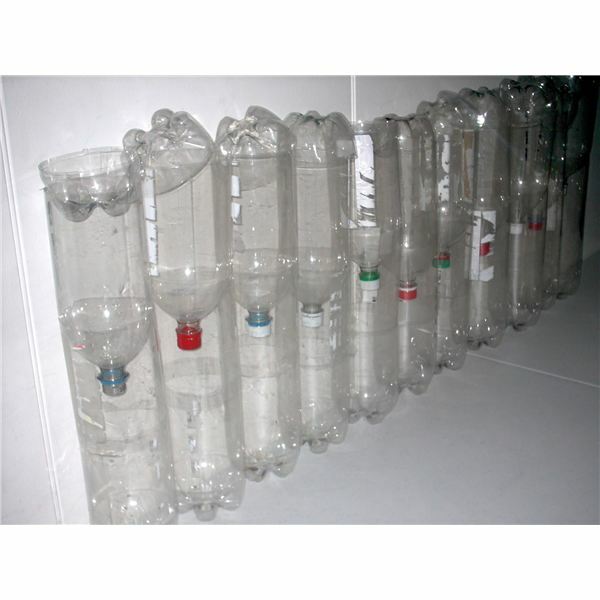 Start by cutting off the top and bottom of one of the soda bottles so that you have a cylinder. On the second bottle cut off the bottom, and on the third bottle, cut off the top. Now, attach the cylinder of bottle one to bottle three. Tip bottle two upside down so that it rests inside of the cylinder, also known as the connector. If done correctly the column should stand upright. The bottom of the eco-column will be used as an aquarium and the top will be used to plant seeds. Above you see can get an idea of what the finished column looks like. On top we put a small piece of mesh screening down first followed by some aquarium stones. On top of this we add our soil and finally plant the seeds in four quadrants that we mark with Sharpie pen around the bottle: mustard seed in one section, grass seed in a second section, and alfalfa seeds in the third. In the fourth section we collect our own debris from outside (small pine cones, leaves, sticks) and add that to the mix. They eventually learn that dead things are important to an ecosystem. For a couple of weeks let the children observe the growth of the terrarium, making notes on how they set it up and changes that they notice on a daily basis. Encourage them to sketch and use a hand lens to get close views of what is happening. Model a good journal response for them and discuss with them what makes it a good response. There are various methods of building an eco-column. To build an aquarium in the second section, carefully remove the top which is where your plants are now growing. Add a layer of sand or gravel to the middle part about an inch thick. Next add a water plant and fill container with water. Allow the water to come to room temperature before adding some small fish or other aquatic animals such as snails. Have your students make observations over the next few days. This article contains additional instructions to making an eco-column. The aquarium component be set up after the terrarium is growing well. The point is that the aquarium life will help sustain the terrarium life and vice versa. The eco-column eventually becomes a microcosm of a larger ecosystem. I recommend you purchasing a kit to help in this process. As mentioned before, Carolina Biological is a good resource. This collection of articles will share ideas that might be helpful in implementing an intermediate unit on ecosystems.